Porto is a fortified wine made from grapes grown in the Douro Valley in northern Portugal. It is a very historic wine having been appreciated for centuries by international clients, especially the British. Made from a blend of local Portuguese grape varieties such as Tinto Roriz (known as Tempranillo in Spain), Tinto Cao, Tinto Barrocca, Touriga Nacional and Touriga Francesca for the red ports and white varieties such as Malvasia and Rabigato for the white ports, which are grown on steep terraces above the Douro River, Port production has greatly modernized over the last two decades. Instead of the 100 or so permitted grapes, growers are today concentrating on the more noble varieties such as Touriga Nacional. The terraces and vineyards are being restored to their former glory and tourism has come to the Douro region with luxury hotels and restored Quintas offering stunning surroundings for wine lovers. The Douro River valley composed of steep granite and schist soils, begins at the town of Barqueiros about 70 kilometers east of the town of Oporto on the coast and runs east to the Spanish border. It is divided into three zones, the Baixo (lower), Corgo, the Cima (higher) Corgo and the Douro Superior. The first two zones are centered on the villages of Régua and Pinhao. The climate here is hot and dry in the summer, cool and wet in the winter. The grapes are harvested and vinified in the local farms, called Quintas. 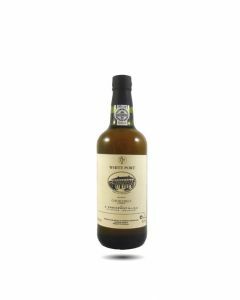 The wine is fortified with a grape brandy to stop fermentation and keep sweetness and alcohol high (around 18%). The wine is then transported down to the town of Oporto where it is aged in barrels in Port lodges in Vila Nova de Gaia on the other side of the river from Oporto. The Port appellation was created in 1756, making it the third oldest in the world behind Chianti (1716) and Tokay (1730). Various different styles of Port are made depending upon whether the wine is aged in barrel or in bottle. They are Tawny, Colheita and Late Bottled Vintage ports that are barrel aged and Ruby, Reserve (Vintage Character, Vintage and Single Quinta Ports, which are bottle aged. A small amount of rosé and white Port is also made. Both the British and the Dutch had a great role to play in the history of Port production and many of the great Port houses today bear their names – Graham, Warre, Churchill and Niepoort. Port is enjoyed both as an aperitif and as a digestif. It goes beautifully with cheese, nuts and chocolate and is much appreciated at the end of a meal. Churchill is renowned for its 'White Port' which is refined and semi-sweet with pretty notes of stewed fruits. Drink chilled. Churchill’s 20 Years Old Tawny Port is an expression of the Douro terroir combined with delicate ageing in seasoned oak casks. 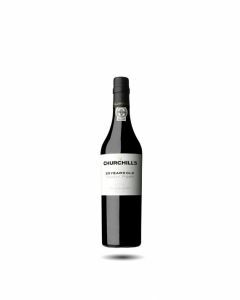 The result of this combination is a port full of finesse whilst still retaining Churchill’s characteristic fresh identity. A pale red tawny colour with a golden rim. A delicate nose of almonds and red Moreno cherries. Savoury and rich on the palate, without losing the grip, it’s a combination of age and finesse, finishing long and fresh. This Old Port Wine combines very well with dried fruits, roasted almonds and mature cheeses.